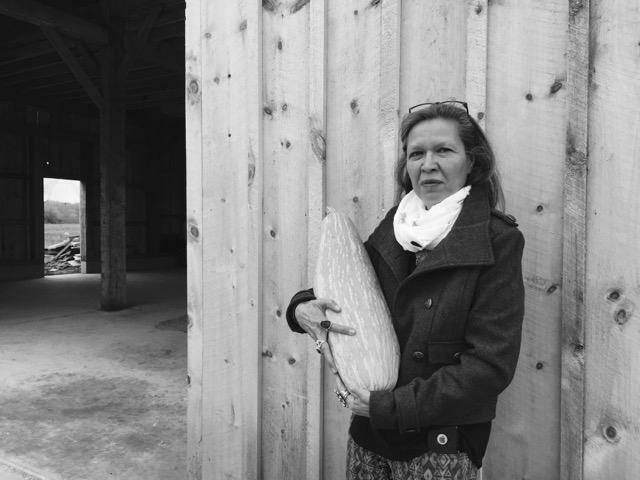 Punkin Shananaquet, a member of the Gun Lake tribe, holds a Gete Okosman squash at the Gteganes Farm. 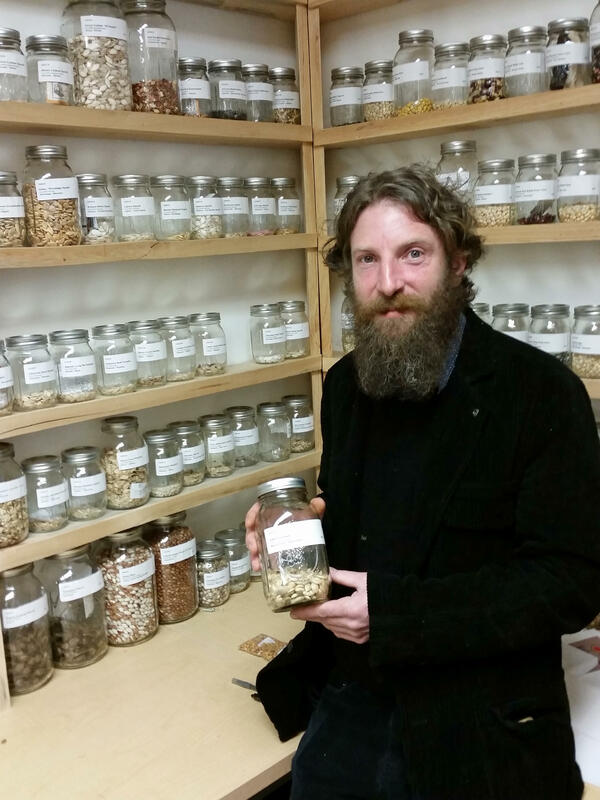 Kevin Finney, executive director of the Jijak Foundation, in the seed library. 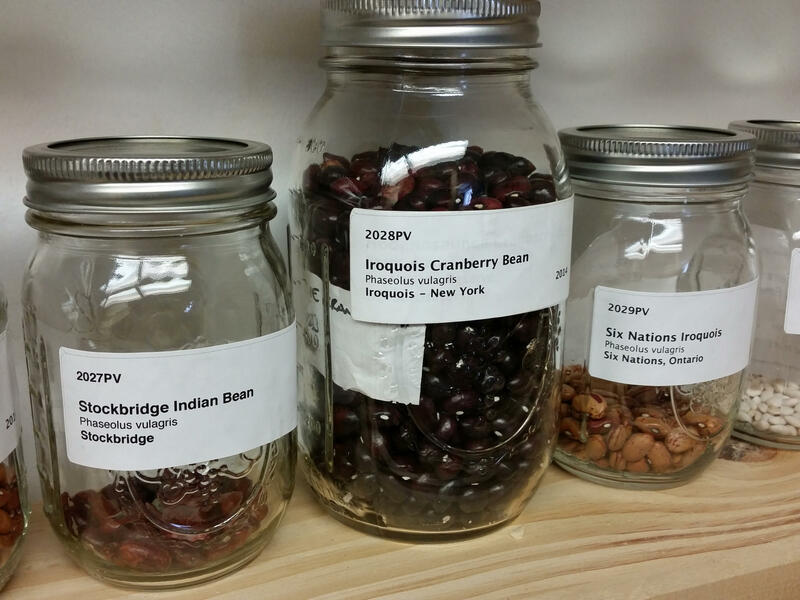 Some varieties of beans from the Great Lakes region. Seeds in the Jijak Foundation seed library. Tobacco plants in the greenhouse near the Jijak Foundation office. 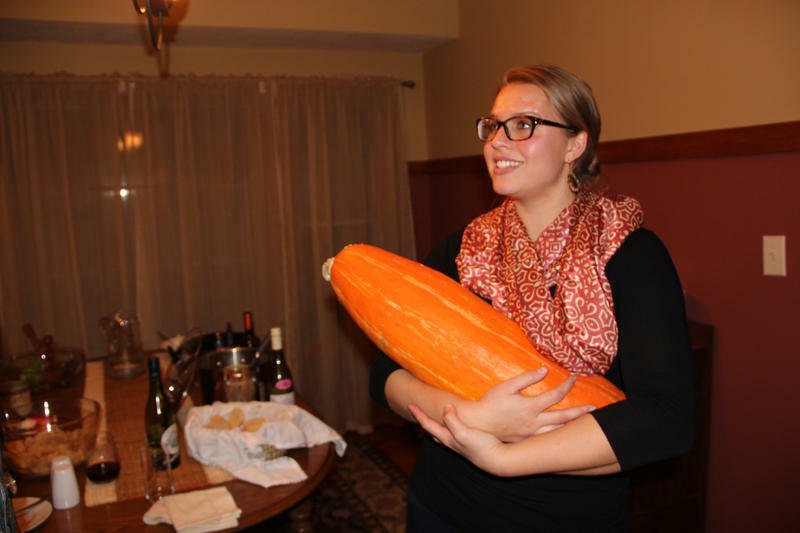 Sarah Hofman-Graham with one of the squashes that grew on Eighth Day Farm. Last year, the farm was given seeds of a mystery squash. They didn’t know what to expect when they planted it. “I definitely didn’t have a firm idea of what kind of squash it was going to grow or even what the plant was going to look like necessarily – it was just a fantastic surprise!” she says. The seeds grew into massive bright orange squashes: more than two feet long. The seeds of this squash were passed through a couple of pairs of hands before they got to the farm. I made some calls and traced them back to Paul DeMain. He’s of Ojibwe descent and a member of the Oneida Nation of Wisconsin, and he’s the editor of News from Indian Country. They're thought to be from a line that's somewhere between 1,000 to 2,000 years old. DeMain says his seeds originally came from the Miami tribe in Indiana. They’re thought to be from a line that’s somewhere between 1,000 to 2,000 years old. “A finding during a construction project somewhere in Wisconsin in which a clay vessel was unearthed, and there were seeds in it that were regrown, and allegedly these seeds were dated about 850-900 years ago,” he says. Some say the story of the clay vessel is an urban myth. But regardless, DeMain says people are excited to have these seeds back in circulation, and they've been sharing the seeds with each other over the past couple of years. “It really is as communities begin healing after a hundred years of decline, of displacement; it comes along with a revival of the language, the revival of songs and ceremonies,” he says. I recently visited Kevin Finney, the executive director of the Jijak Foundation. It’s a nonprofit group that’s part of the Gun Lake Band of Pottawatomi in Hopkins, Michigan. Finney took me to a small basement room in the Jijak office, to show me the menomineekanin seed library. There are dozens of glass jars on wooden shelves, with native varieties of corn, beans, tobacco, watermelon, and ancient squash. Seeds of the ancient squash. 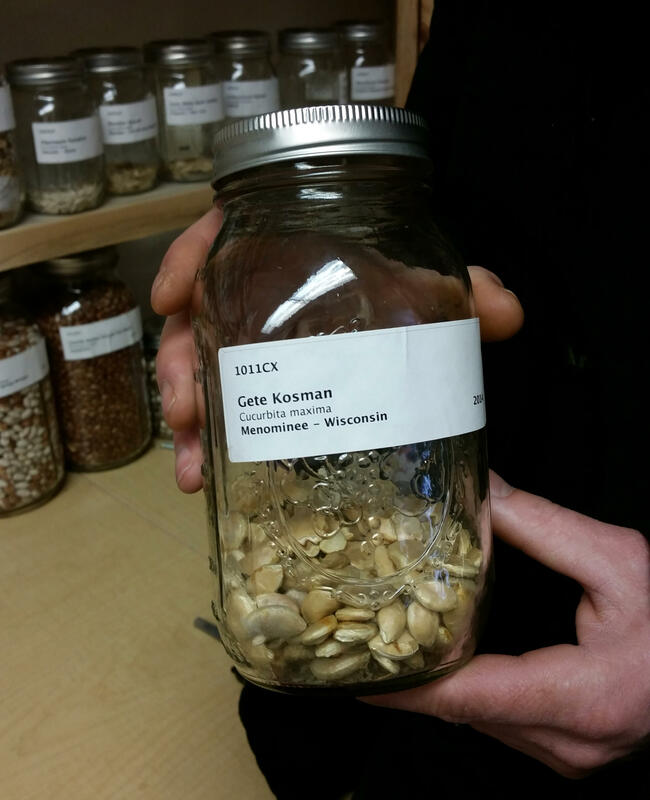 Finney opened a jar of the seeds of the ancient squash - it's called Gete Okosman: gete means ancient, or something from a long time ago and okosman is the word for squash. “They’re big just like the squash. They’re big and really fat and that’s a good thing for a seed,” he says. He calls the ancient squash heroic. 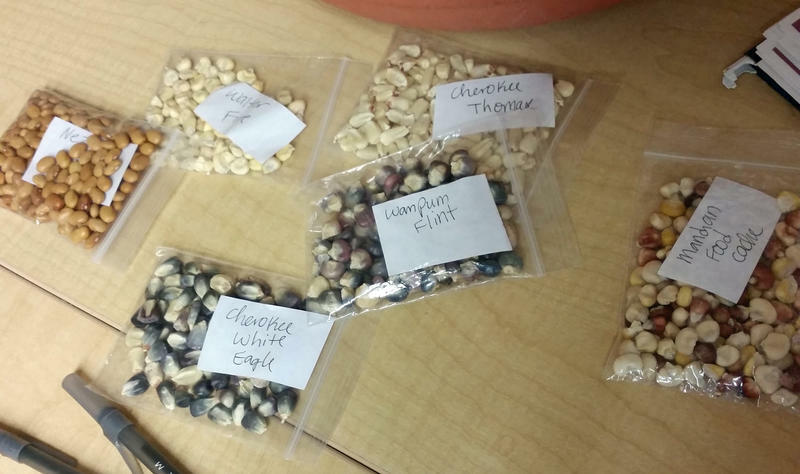 Finney says native farmers around the region can borrow seeds. 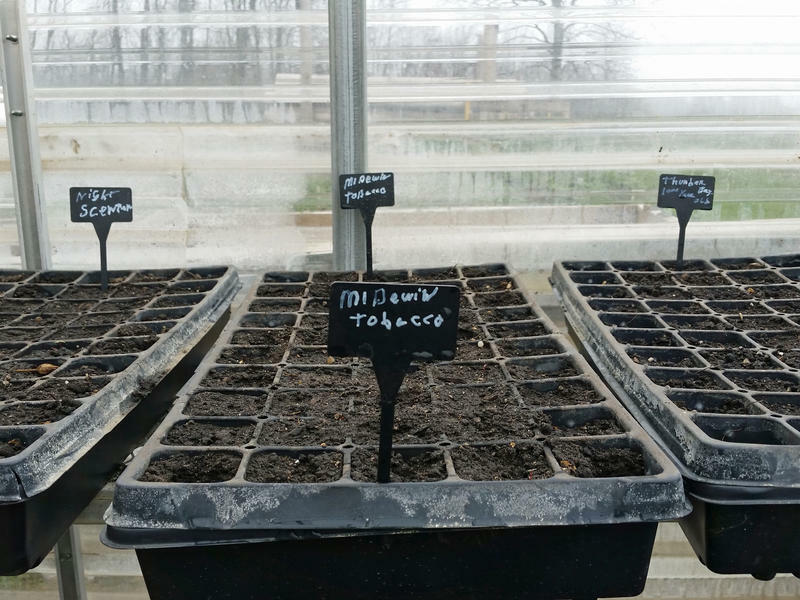 “Like a library, they check out seeds and they will grow a certain variety of corn or beans or tobacco or squash and at the end of the year, they send us back a return on those seeds as well as keeping some,” he says. "This squash has re-emerged; it's an ancient, lost and forgotten thing. It's a champion for all of these seeds. They were forgotten and all of them are making their re-emergence again." When a person checks out a seed, they also get a copy of the oral history that comes along with the seed, things such as: where did the seed come from, what are your stories from your family about this seed, how does it grow best? Finney says he wants people outside the tribes to know about these foods, too. “Maybe success is, if you live here in West Michigan, you understand and maybe everyone’s aware of what Anishanabe food is and the accessibility to these foods becomes very accessible for people. This is sustainability for everyone and local food for everyone,” he says. The tribe is also reviving traditional farming methods here on 200 acres. Yebishawn Old Shield is working in the greenhouse. She says she thinks about how long the ancient squash seeds have lasted. 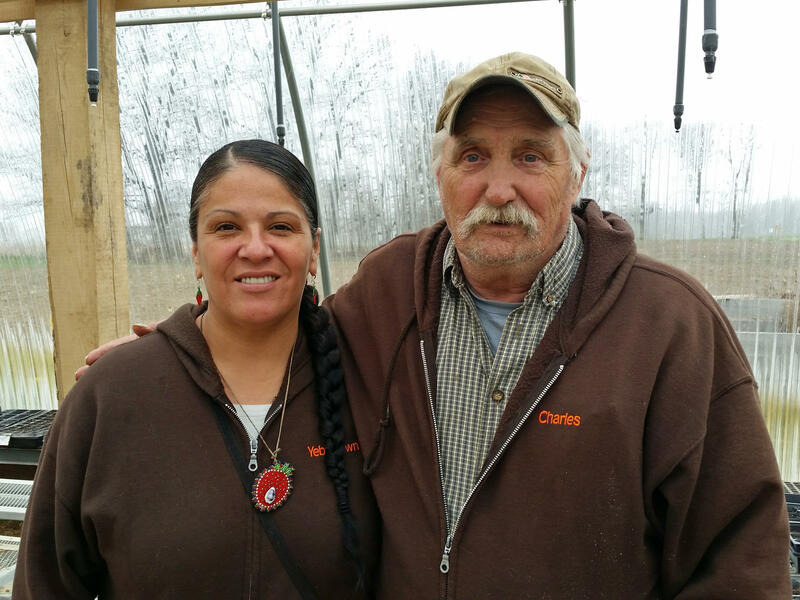 Yebishawn Old Shield and Charles Barker, members of the Gun Lake tribe. She says the work they’re doing here is building what they call food sovereignty: growing their own food in traditional ways, on tribal land. *Clarification - an earlier version of this story didn't point out that the clay vessel story is viewed as an urban myth by some. We made note of that above.